phone-plug connector. The Series "400" probes are 2252 Ohm @ 25°C. ON-401-PP-V Water resistant, soft, flexible, vinyl tipped version of above model. ON-406-PP Same as ON-405-PP but with economical plastic housing. General Purpose. Used for short-term water and sub-soil readings. Most rugged, water resistant construction. Vinyl tipped version of above model. Small Flexible. Vinyl sheath and tip. 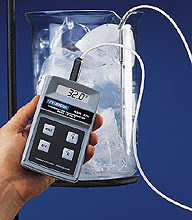 Cuvette temperatures. General purpose measurement. Continuous length. Tubular. Stainless steel probe for rugged duty. Often used for liquid immersion. Probe is immersible only to cap. Air Temperature. Stainless steel probe suitable for test rooms, incubators, remote air readings, monitoring of gas streams, etc. Same as ON-405-PP but with economical plastic housing. Attachable Surface Temperature. Stainless steel cup, epoxy-backed. Easy to tape on flat surfaces. Good for heat loss or compression efficiency study of piping. Tubular With Fitting. Rugged, stainless steel probe with pipe fitting.Suitable for taking readings in pipes or inside closed vessels.